We invite you to learn more about the two books in the series! Valley Cats is more than a story of adventure. It’s a celebration of seasonal beauty and regional history, a lesson in trying new things and a tribute to having fun. Most of all, it’s a story of friendship. 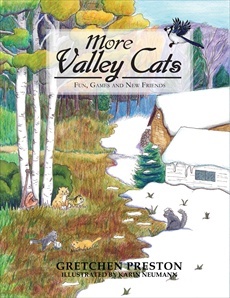 Valley Cats is an engaging elementary chapter book and an ideal bedtime storybook. Children of any age will enjoy Boonie and River’s antics set amidst the beautiful backdrop of Michigan’s Upper Peninsula. Take your first step here with our featured story, '"Pet Parade." 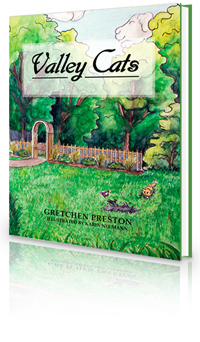 This narrative is the first of 14 incredible tales from the children’s book Valley Cats, written by Gretchen Preston and Illustrated by Karin Neumann. Learn of the friendship that transpires between the ladies of the valley and their pets. Valley Cats is available through our online store. Please feel free to contact us concerning special pricing on quantities exceeding 25 children's books. Perfect for the classroom, group studies of literature, book clubs, and gifts, Valley Cats can bring a new chapter to the lives of children and adults. The following is an excerpt from Chapter One. The next afternoon arrived quickly. Big Tim, one of the Valley neighbors, directed the event. The dogs went first, parading down Valley Road on leashes held by their masters. Next, it was time for the cats. There were only two cats in the Pet Parade - Boonie and River. The microphone boomed with Big Tim’s loud voice. “Next we have the Valley Cats…Boonie and River!” Mrs. Mahoney pulled River onto the road in his decorated wagon. Grace was fast behind with Boonie in a pink Barbie car. He was wearing a leather driving cap, and he looked super cool. The Valley Cats waved their paws, first at each other, and then to the small crowd lined up along the side of the dirt road. It was fun to be in a parade. Both cats felt like superstars. 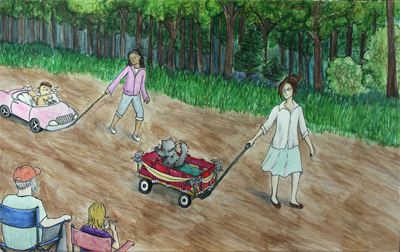 At the end of the ride, Boonie jumped out of the Barbie car and approached River’s wagon. “Hey man…I like your wagon,” he said. “I’m Boonie. I live with Grace at the end of the road.” Boonie held out his paw. tales by visiting our online store today! NOW AVAILABLE: THE NEXT BOOK IN THE SERIES! The native birds, animals, local plants, and trees of Michigan's Upper Peninsula brighten the pages. A splash of local food will tempt your taste buds. But don't fret, adventure lovers! More adult cats, a batch of orphan kittens and new people friends will tickle your fancy! Follow the Valley Cats adventures by using the map. There's more fun down by the Valley Road mailboxes when the cats learn about jokes. Boonie and River take a long hike. The pair travel up and over the ridge where they have never gone before. Find the tree house, the beehive and the Valley softball diamond. You won't believe what happens there! Keep score when the cats play a game of marble hockey. The fun continues inside the boat shop when the Valley Cats are home alone. And don't miss learning a trick to get a mouse out of the house! Fans of the Valley Cats will not be disappointed! Welcome back to the Valley, the home of the Valley Cats. All is well in the hills above the south shore of Lake Superior. Boonie and River are ready to share new tales of fun and adventure. The new stories begin on the first day of spring and end on a cold winter's night. Visit an island lake, a deer camp and journey through the summer night sky. We invite you to visit our online store for all our Valley Cats products. These colorful and inspiring books will brighten up the day of children of all ages! 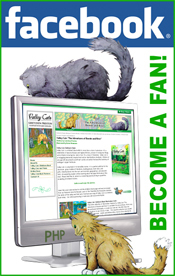 Purchase your copy of the children's book Valley Cats today. Online purchasing is secure with PayPal. Gretchen Preston was raised in Portland, Oregon. Her parents read to their children every night at bedtime. She fell in love with stories as a very young child. Gretchen attended the University of Oregon and went on to graduate school at Arizona State University where she earned a master's degree in social work. She credits her writing prowess to learning to write in graduate school. Trained as a medical social worker, Gretchen frequently wrote newsletters, articles for professional journals and developed educational handbooks. Please select the Learn More button to read on.